The Parish of Fremington is situated in North Devon. It has four distinct areas of population, the older villages of Yelland, Fremington and Bickington and the newer development of Roundswell. The area of Woodville is also within the Parish. The parish covers some 2526 hectares along the south side of the estuary of the river Taw. About 15% of the parish is densely populated, the remainder being open countryside, with a few tiny hamlets, and woodland. There are two Local Nature Reserves within the parish, which complement the RSPB reserve at Isley Marsh and the Gaia Trust’s nature reserve at Home Farm Marsh. There is a network of well maintained footpaths and the Tarka Trail runs through the parish. An interesting leaflet is available from the Parish Office detailing a number of walks. There are a good range of shops and facilities within the whole parish, from small local shops to a retail park. The Parish Council runs 8 play areas. Following an award from the Football Foundation new football pitches and changing rooms have been provided at Roundswell (Tews Lane). The Parish Council is also responsible for Fremington cemetery, an environmental area (Griggs Field) and Fremington Village Green and an open space at Maple Grove Roundswell. 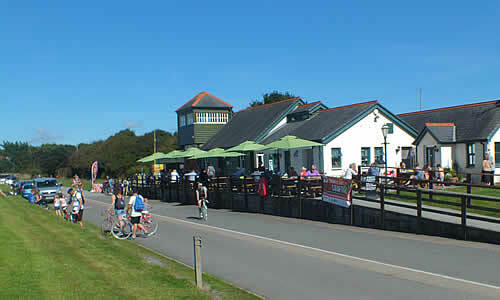 In the late 1990s the Parish Council redeveloped Fremington Quay, which now has a heritage/visitor centre and café. The Parish Council runs two allotment sites, one at Muddlebridge and one at Babbages.